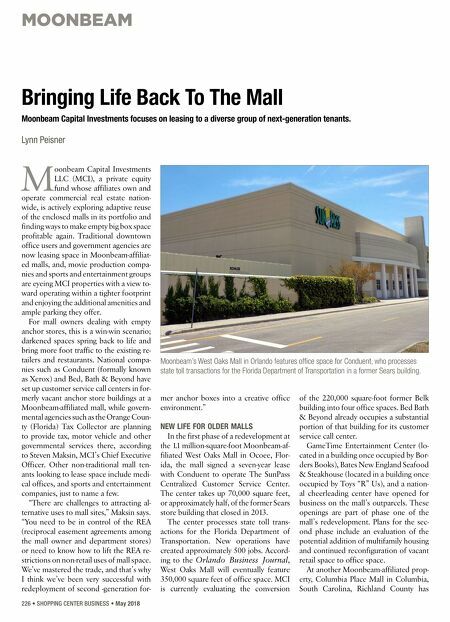 MOONBEAM 226 • SHOPPING CENTER BUSINESS • May 2018 M oonbeam Capital Investments LLC (MCI), a private equity fund whose affiliates own and operate commercial real estate nation- wide, is actively exploring adaptive reuse of the enclosed malls in its portfolio and finding ways to make empty big box space profitable again. Traditional downtown office users and government agencies are now leasing space in Moonbeam-affiliat- ed malls, and, movie production compa- nies and sports and entertainment groups are eyeing MCI properties with a view to- ward operating within a tighter footprint and enjoying the additional amenities and ample parking they offer. For mall owners dealing with empty anchor stores, this is a win-win scenario; darkened spaces spring back to life and bring more foot traffic to the existing re- tailers and restaurants. 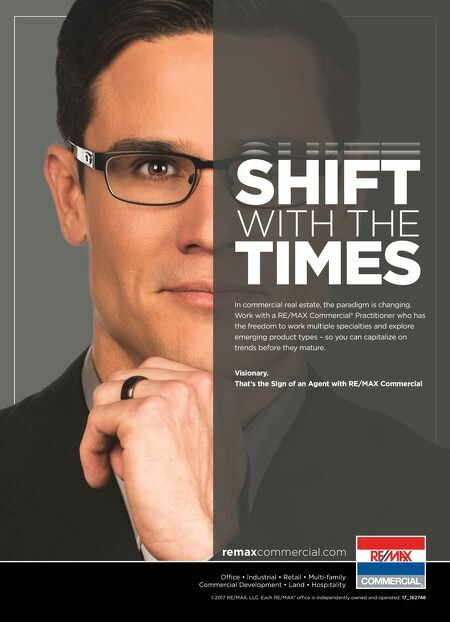 National compa- nies such as Conduent (formally known as Xerox) and Bed, Bath & Beyond have set up customer service call centers in for- merly vacant anchor store buildings at a Moonbeam-affiliated mall, while govern- mental agencies such as the Orange Coun- ty (Florida) Tax Collector are planning to provide tax, motor vehicle and other governmental services there, according to Steven Maksin, MCI's Chief Executive Officer. Other non-traditional mall ten- ants looking to lease space include medi- cal offices, and sports and entertainment companies, just to name a few. "There are challenges to attracting al- ternative uses to mall sites," Maksin says. "You need to be in control of the REA (reciprocal easement agreements among the mall owner and department stores) or need to know how to lift the REA re- strictions on non-retail uses of mall space. We've mastered the trade, and that's why I think we've been very successful with redeployment of second -generation for- mer anchor boxes into a creative office environment." NEW LIFE FOR OLDER MALLS In the first phase of a redevelopment at the 1.1 million-square-foot Moonbeam-af- filiated West Oaks Mall in Ocoee, Flor- ida, the mall signed a seven-year lease with Conduent to operate The SunPass Centralized Customer Service Center. The center takes up 70,000 square feet, or approximately half, of the former Sears store building that closed in 2013. The center processes state toll trans- actions for the Florida Department of Transportation. New operations have created approximately 500 jobs. Accord- ing to the Orlando Business Journal, West Oaks Mall will eventually feature 350,000 square feet of office space. MCI is currently evaluating the conversion of the 220,000 square-foot former Belk building into four office spaces. Bed Bath & Beyond already occupies a substantial portion of that building for its customer service call center. GameTime Entertainment Center (lo- cated in a building once occupied by Bor- ders Books), Bates New England Seafood & Steakhouse (located in a building once occupied by Toys "R" Us), and a nation- al cheerleading center have opened for business on the mall's outparcels. These openings are part of phase one of the mall's redevelopment. Plans for the sec- ond phase include an evaluation of the potential addition of multifamily housing and continued reconfiguration of vacant retail space to office space. At another Moonbeam-affiliated prop- erty, Columbia Place Mall in Columbia, South Carolina, Richland County has Bringing Life Back To The Mall Moonbeam Capital Investments focuses on leasing to a diverse group of next-generation tenants. Lynn Peisner Moonbeam's West Oaks Mall in Orlando features office space for Conduent, who processes state toll transactions for the Florida Department of Transportation in a former Sears building.